References m_buttonFind, m_buttonFindReplace, m_buttonReplaceAll, m_checkbuttonMatchCase, m_checkbuttonReverseFind, m_checkbuttonWholeWord, m_comboFind, m_comboReplace, and m_windowMain. References AP_DIALOG_ID_REPLACE, AP_Dialog_Replace::ConstructWindowName(), CONVERT_TO_ACC_STRING, CONVERT_TO_UNIX_STRING, FREEP, AP_Dialog_Replace::getMatchCase(), AP_Dialog_Replace::getReverseFind(), XAP_App::getStringSet(), AP_Dialog_Replace::getWholeWord(), m_buttonFind, m_buttonFindReplace, m_buttonReplaceAll, m_checkbuttonMatchCase, m_checkbuttonReverseFind, m_checkbuttonWholeWord, m_comboFind, m_comboReplace, XAP_Dialog::m_id, XAP_Dialog::m_pApp, m_windowMain, AP_Dialog_Replace::m_WindowName, newDialogBuilder(), s, s_delete_clicked(), s_destroy_clicked(), s_find_clicked(), s_find_entry_activate(), s_find_entry_change(), s_findreplace_clicked(), s_match_case_toggled(), s_replace_entry_activate(), s_replaceall_clicked(), s_response_triggered(), s_reverse_find_toggled(), and s_whole_word_toggled(). References _updateLists(), AP_DIALOG_ID_REPLACE, append_string_to_model(), AP_Dialog_Replace::getFindString(), AP_Dialog_Replace::getMatchCase(), AP_Dialog_Replace::getReplaceString(), m_checkbuttonMatchCase, m_comboFind, m_comboReplace, XAP_Dialog::m_id, and UT_ASSERT. References append_string_to_model(), UT_GenericVector< T >::getItemCount(), and UT_GenericVector< T >::getNthItem(). References _updateList(), m_comboFind, m_comboReplace, AP_Dialog_Replace::m_findList, and AP_Dialog_Replace::m_replaceList. References AP_Dialog_Replace::ConstructWindowName(), m_windowMain, AP_Dialog_Replace::m_WindowName, and UT_ASSERT. References _storeWindowData(), abiDestroyWidget(), m_windowMain, and XAP_Dialog_Modeless::modeless_cleanup(). References UT_UCS4String::empty(), AP_Dialog_Replace::findNext(), AP_Dialog_Replace::findPrev(), get_combobox_text(), AP_Dialog_Replace::getReverseFind(), m_comboFind, m_comboReplace, AP_Dialog_Replace::setFindString(), AP_Dialog_Replace::setReplaceString(), and UT_UCS4String::ucs4_str(). Referenced by s_find_entry_activate(), and s_response_triggered(). 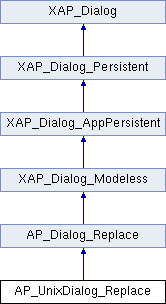 References AP_DIALOG_ID_REPLACE, UT_UCS4String::empty(), get_combobox_text(), m_buttonFind, m_buttonFindReplace, m_buttonReplaceAll, m_comboFind, and XAP_Dialog::m_id. References AP_Dialog_Replace::findReplace(), AP_Dialog_Replace::findReplaceReverse(), get_combobox_text(), AP_Dialog_Replace::getReverseFind(), m_comboFind, m_comboReplace, AP_Dialog_Replace::setFindString(), AP_Dialog_Replace::setReplaceString(), and UT_UCS4String::ucs4_str(). Referenced by s_replace_entry_activate(), and s_response_triggered(). References AP_Dialog_Replace::findReplaceAll(), get_combobox_text(), m_comboFind, m_comboReplace, AP_Dialog_Replace::setFindString(), AP_Dialog_Replace::setReplaceString(), and UT_UCS4String::ucs4_str(). References _constructWindow(), _populateWindowData(), abiSetupModelessDialog(), BUTTON_CANCEL, XAP_Dialog_Modeless::getActiveFrame(), AP_Dialog_Replace::setView(), and UT_return_if_fail. References abiDestroyWidget(), BUTTON_FIND, BUTTON_REPLACE, BUTTON_REPLACE_ALL, event_Find(), event_Replace(), event_ReplaceAll(), and UT_return_if_fail. Referenced by _constructWindow(), AP_UnixDialog_Replace(), and event_FindEntryChange(). Referenced by _constructWindow(), _populateWindowData(), AP_UnixDialog_Replace(), and event_MatchCaseToggled(). Referenced by _constructWindow(), AP_UnixDialog_Replace(), and event_ReverseFindToggled(). Referenced by _constructWindow(), AP_UnixDialog_Replace(), and event_WholeWordToggled(). Referenced by _constructWindow(), _populateWindowData(), _updateLists(), AP_UnixDialog_Replace(), event_Find(), event_FindEntryChange(), event_Replace(), and event_ReplaceAll(). Referenced by _constructWindow(), _populateWindowData(), _updateLists(), AP_UnixDialog_Replace(), event_Find(), event_Replace(), and event_ReplaceAll(). Referenced by _constructWindow(), activate(), AP_UnixDialog_Replace(), destroy(), and notifyActiveFrame().